Best suited to keeping loads lashed together rather than plain lifting duties, our 6×24 configuration galvanised rope is a top option for various industrial uses. With a 22mm diameter, 22mm 6×24 Galvanised Wire Rope has good performance capabilities and impressive corrosion resistance. Working with this wire rope as a lashing solution for loads including lumber and other materials makes sense because of its flexibility. A fibre core is used here, standing in for a steel wire core and sacrificing strength in favour of being malleable. At this 22mm diameter, our 6×24 rope is able to withstand weights of up to 27,076kg. The galvanised surface of the wires will not rust when water comes in contact with it, so for uses where rain and sea spray are present, this is an obvious choice, along with stainless steel rope. You can make your 22mm 6×24 galvanised wire rope order more functional and effective from day one if you request that the engineers at Rope Services Direct create a bespoke assembly that uses it. We use the latest technologies, tools and accessories to get excellent results that are made to last and priced to be cost-effective. If all the wire rope options available to you have left you floundering, call us on 01384 78004 or email your query to the RSD sales team. A quick chat with us will set you on the right path and clear up any issues you might have. 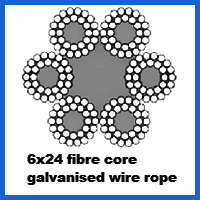 22mm 6x24 Galvanised Wire Rope Overall rating: 5 out of 5 based on 6 reviews.